Watching Africa’s iconic large cats – Lion, Leopard and Cheetah – is always a special treat on any safari. But these three sighting were even more exciting than usual. First we saw Thanda’s dominant male Lion mating with the oldest female of the Mduna pride. Then we observed a young Cheetah female doing what Cheetahs ‘never do’, climbing up a tree trunk. And last but not least we sat with a relaxed and very beautiful male Leopard for quite a while, in broad day light! 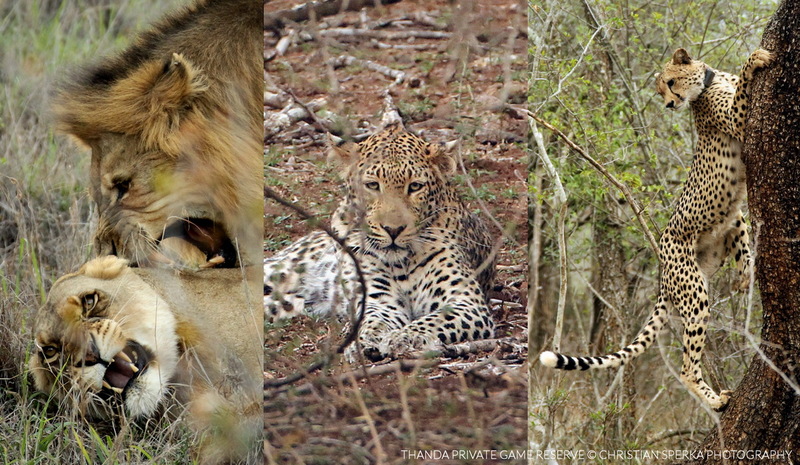 A pleasure for the Thanda guests and great picture opportunities for all Wildlife photographers among them!